A sample decision from from a judge. In this case, the judge refused the defendants’ request to dismiss the lawsuit. This case alleges a claim for excessive force, in violation of the Fourth Amendment protection against unreasonable search and seizure, as well as a claim for retaliation, in violation of the First Amendment right to free speech. 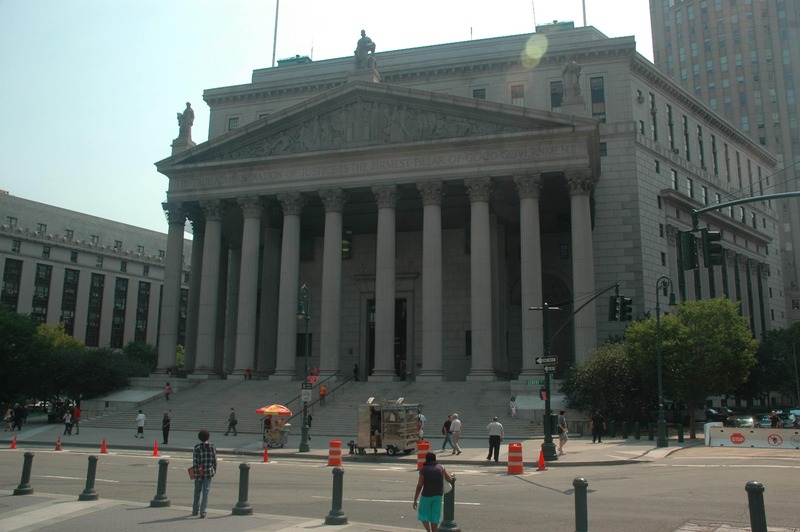 William Gerard Martin, Martin & Colin, P.C., White Plains, NY, for Plaintiff. The following allegations of fact are recited most favorably toward plaintiff. Justin Tonawanda began working as a manual laborer with the Village of St. Augustine Highway Department in the summer of 2000. He was hired by Gary Carter, who is the Superintendent of that Department and who was, at all times, plaintiff’s immediate supervisor. On May 14, 2009, Tonawanda — who moonlighted by delivering pizzas for a local pizzeria — was driving on a public street in the Village of St. Augustine, returning from a delivery. He saw a police car with lights flashing, pulled over, turned off his vehicle and exited. Officer Pinkus, who is not a defendant in this action, ordered Tonawanda to get back into his car. Tonawanda mouthed off to the officer, but complied with a second order to return to his car. A second police car, containing defendant Officer Timothy Sanders and a third policeman, pulled up behind plaintiff’s vehicle. Plaintiff claims to have been driving well under the speed limit and to have had no idea that the police were pulling him over or why they would have done so. He was upset, and repeatedly told Pinkus that if he (plaintiff) lost his job with the pizzeria, it would be the officer’s fault. However, he did give Pinkus his license and registration, as requested. Defendant Sanders approached Tonawanda’s car and asked plaintiff who he was threatening. Tonawanda responded, “No one,” which is hardly surprising, since the phrase, “If I lose my job, it will be your fault,” expresses no threat toward anyone. Sanders, however, ordered plaintiff to get out of his car. As plaintiff was complying with this directive, Sanders grabbed Tonawanda’s left hand, yanked him out of his car, spun him around, put his elbow onto the back of plaintiff’s neck and pressed him against the frame of the car. He next kicked plaintiff in the leg to spread them and twisted plaintiff’s wrist. When plaintiff screamed, Sanders asked, “Are you high on crack?” Instead of answering the question or keeping quiet, Tonawanda’s mouthed off again, expressing the point of view that it was Sanders who did crack. Sanders kept plaintiff’s wrist twisted behind his back for about two minutes, until Tonawanda yelled, “Police brutality!” At that point, Sanders stopped twisting plaintiff’s wrist, though he did not let go of plaintiff’s arm until he placed Tonawanda into Pinkus’s patrol car. Plaintiff did not use force against any of the officers. Sanders then searched Tonawanda’ vehicle, including the passenger compartment and the locked trunk, for approximately five minutes. He then ordered plaintiff to return to his car. Pinkus issued three traffic tickets to Tonawanda, all for not stopping at a stop sign. The incident ended. Later that night, Tonawanda went to the St. Augustine Police Station and filed a report against Sanders. Approximately two months later, on July 16, 2009, Tonawanda served a notice of claim on the Village, alleging police brutality. From this incident, there allegedly flowed a series of consequences. First, plaintiff suffered physical injury at Sanders’s hands. On the night of the incident, he drove himself to the hospital. The wrist was x-rayed and placed in a soft cast. A Dr. Dodge told Tonawanda he would need an operation. Surgery was performed on October 31, 2009. Second, he lost his job with the Village of St. Augustine. Because of the injury, plaintiff was unable to work. The day after the incident, plaintiff reported his injury to Carter, who told him to bring a doctor’s note when he came back to work. Plaintiff was not medically cleared to return to work until April 13, 2010. When he told Carter he was ready to come back, Carter told him that he was not permitted to come back, and cited as the reason his pending lawsuit against the Village. On prior occasions, plaintiff had missed work due to injury, but was always allowed back with a doctor’s note. Moreover, at or about the time plaintiff was told he would not be allowed back, the Village’s DPW was hiring laborers. When plaintiff put in an application for one of those jobs, Carter told him that St. Augustine’s Mayor, defendant Brian Moore, would not permit Carter to rehire Tonawanda because of the pending lawsuit. Tonawanda tried to make an appointment with Moore, but the Mayor refused to see him. Third, plaintiff was targeted by Sanders on two other occasions. Two days after he filed his Notice of Claim, on July 18, 2009, plaintiff and three other individuals, who were drinking on the street in violation of St. Augustine’s Open Container Law, were arrested after Sanders — one of the four officers who approached the men about their drinking — spied a paper bag on the ground in the vicinity of the group that Sanders believed contained cocaine. Plaintiff denied any knowledge of the cocaine, as did the other three men. All four men were arrested. One of the four arrestees was released almost immediately, but plaintiff and the two others were detained for several days on charges of Criminal Possession of a Controlled Substance. In a search incident to the arrest, cocaine was found on one of the four men, Billy Lupien, but not on plaintiff’s person. Plaintiff remained in jail for several days, until his family could arrange to post bail. All charges against plaintiff arising out of this arrest were dismissed when Lupien pled guilty to possession. A few weeks later, Sanders allegedly ticketed plaintiff’s car. Unlike plaintiff, Lupien — the man who pled guilty to possessing cocaine — was returned to his position as a laborer with the DPW only two weeks after he was released from the County Correctional Facility after serving sentences for felony assault and narcotics possession. The officers have put in affidavits that tell their side of this story. For purposes of this motion — which is limited to the issue of qualified immunity — those affidavits are irrelevant. In deciding a motion to dismiss on the issue of qualified immunity, plaintiff’s allegations of fact are presumed to be true. McKenna v. Wright, 386 F.3d 432, 434 (2d Cir.2010). The issues to be decided are whether — assuming plaintiff’s story to be true in all respects — any constitutional violation occurred, and if one did, whether any defendant who was personally involved with that violation is entitled to invoke qualified immunity. Saucier v. Katz, 533 U.S. 194, 201, 121 S.Ct. 2151, 150 L.Ed.2d 272 (2001). Use of excessive force against Sanders for the events of May 14, 2009 (Fourth Amendment). Illegal search of his vehicle without probable cause on May 14, 2009 (Fourth Amendment). resuming his employment with the Village of St. Augustine, and refusing to hire plaintiff into a vacant position similar to his former position, in retaliation for his having filed a complaint and a Notice of Claim against the Village and Sanders. In addition to his federal claims, plaintiff asserts parallel claims under the New York State Constitution, and claims against Sanders for common law battery and malicious prosecution (under New York State law). He also throws in the usual claim for intentional infliction of emotional distress (a highly disfavored claim under New York law). Sanders, Carter and Moore all assert that they are entitled to qualified immunity. Because they are individuals who are alleged to have committed constitutional torts while acting under color of state law, the doctrine applies to them. Unfortunately, their counsel makes the all too common error of conflating that doctrine with arguments that plaintiff is not entitled to relief on the merits, either because the facts are not as recited by plaintiff or because no constitutional violation was committed. I will sort this out below. with the rights they are alleged to have violated.” Anderson v. Creighton, 483 U.S. 635, 638, 107 S.Ct. 3034, 3038, 97 L.Ed.2d 523 (1987). In Saucier v. Katz, 533 U.S. 194, 121 S.Ct. 2151, 150 L.Ed.2d 272 (2001), the Supreme Court indicated that the availability of qualified immunity ought to be decided by a court at the earliest possible opportunity — preferably at the outset of the case, at which point plaintiff’s well pleaded allegations are assumed to be true, and defendant’s version of the facts is immaterial. Thus, as the Second Circuit explained in Stephenson v. John Doe, Detective, 332 F.3d 68 (2d Cir.2009), when determining a motion to dismiss on qualified immunity grounds in advance of full merits discovery, and the question to be answered is whether a reasonable Government officer, confronted with the facts as alleged by plaintiff, could reasonably have believed that his actions did not violate some settled constitutional right. The inquiry is a two-step one. First, the court must determine whether, taking the facts in the light most favorable to the party asserting the injury, a constitutional infraction was committed. Saucier, supra, 533 U.S. at 201, 121 S.Ct. 2151. If the answer to that question is yes, the court must decide whether a reasonable official in defendant’s position (as that position is described by plaintiff) ought to have known that he was violating plaintiff’s constitutional rights by doing what plaintiff alleges he did.3 Ordinarily, the relevant inquiry will be whether the law is in fact well-settled — because if it is, “the immunity defense ordinarily should fail, since a reasonably competent public official should know the law governing his conduct.” Harlow v. Fitzgerald, 457 U.S. 800, 818-19, 102 S.Ct. 2727, 73 L.Ed.2d 396 (1982). Claims that a public officer made a reasonable mistake of fact, “go to the question of whether the plaintiff’s constitutional rights were violated, not the question of whether the officer was entitled to qualified immunity.” Stephenson, supra, 332 F.3d at 78 (citing Saucier, supra, 533 U.S. at 205, 206, 121 S.Ct. 2151). It is no defense to a claim of qualified immunity that the defendant did not do what plaintiff said he did. At this early stage of a lawsuit, before discovery takes place, we are presuming that the plaintiff’s version of events is true, so a court cannot take into account assertions by the accused officer that contradict the plaintiff’s allegations. Nothing in Saucier can be read to deprive the plaintiff of his Seventh Amendment right to have a jury resolve all disputed issues of material fact. If plaintiff’s version of the facts is wrong and defendant’s is correct, then the defendant will prevail, not on the ground of qualified immunity, but because he did nothing wrong. a reasonable trier of fact to constitute excessive force (for example, if plaintiff alleged only that the defendant took him by the hand), an officer accused of using excessive force will ordinarily not be able to get out of a lawsuit prior to discovery on the ground of qualified immunity. If the officer’s defense is that the force he used was not excessive — that is, the force used was reasonably necessary to effect the arrest — then the officer is asserting that he did not violate the plaintiff’s constitutional rights, and while he may ultimately prevail on the merits, he is not entitled to dismissal of the lawsuit at an early stage. Here, plaintiff alleges that he did everything the officers asked him to do and used absolutely no force against them, but was nonetheless seriously injured by an arresting officer, to a degree that required surgery and kept him out of work for almost a year. It has long been the law in this Circuit that a suspect has a right to be free from “excessively forceful handcuffing.” Robison, supra, 821 F.2d at 923-24 (plaintiff’s statement that an officer threw her up against a fender and twisted her arm behind her back, causing her to suffer bruises lasting a couple of weeks, was sufficient to preclude summary judgment on an excessive force claim). Therefore, a court would have to conclude, as a matter of law, that a constitutional violation was committed if plaintiff’s allegations of fact are true. With these principles in mind, I turn to each of the three individual defendants. Officer Sanders is alleged to have violated Tonawanda’ Fourth Amendment rights in two separate ways. First, he is alleged to have used excessive force against plaintiff while effecting his arrest. Second, he is alleged to have conducted an illegal search of plaintiff’s car, without probable cause to believe that a crime had been committed. He is not entitled to Saucier qualified immunity against either of these charges. The excessive force charge is analyzed above, in my example of how qualified immunity does — and does not — work. Plaintiff charges that Sanders broke his wrist even though plaintiff was not resisting arrest, refusing to follow any order of the police officers, or using any force against them. The right to be free from excessive force is well-settled. If the facts are as plaintiff alleges, no reasonable police officer could possibly have thought it was necessary to use the degree of force that Sanders allegedly used in this case. If in fact it was necessary for Sanders to break plaintiff’s wrist in order to subdue him — if, for example, plaintiff was flailing around or trying to escape — then, assuming Sanders’s demand that he get out of the car was lawful, the officer will be exonerated at trial.5 But he cannot get out of the lawsuit at this early stage on that basis. Plaintiff also alleges that Sanders illegally searched his car. The right to be free from unreasonable searches — that is, searches conducted without probable cause — is well-settled, and defendant would be hard pressed to assert otherwise. On the facts alleged by plaintiff, no reasonable police officer could possibly have believed he had probable cause to search either Sanders or his car for cocaine. The record contains only the allegations that, while plaintiff was yelling, Sanders asked, “Are you high on cocaine?” — a question to which plaintiff regrettably gave a smart-assed answer. Nothing in the record at this time suggests that Sanders saw a suspicious bulge in plaintiff’s pocket, or glimpsed what looked like a glassine envelope on the floor of Tonawanda’s car through the open door, or anything else that would have given rise to probable cause to believe that plaintiff had any drugs in his possession. The fact that a man yells when his arm is twisted so hard that it breaks his wrist, or that he gives a sassy answer to a question about drug use, does not give rise to probable cause to search a vehicle for drugs. So qualified immunity does not get Sanders out from under this charge, either. If there was probable cause to search, there was no constitutional violation, but determination of that issue must abide Sanders’s testimony. Sanders is also alleged to have retaliated against plaintiff for exercising his First Amendment right to file a complaint and a notice of claim (the necessary precursor to a lawsuit) against Sanders. Plaintiff alleges that Sanders’s decision to arrest him on July 18, 2009, for possession of cocaine, came in retaliation for his filing the local complaint and the notice of claim (the latter having been filed only two days earlier). Here, Sanders’s claim of qualified immunity is trickier to analyze. right to verbally criticize the police without reprisal); see also Wise v. New York City Police Dep’t, 928 F.Supp. 355, 372 (S.D.N.Y.1996) (complaints of systemic police misconduct are protected speech, even when the complainant is a police employee, since the issue is a matter of public concern). Two days prior to this arrest, plaintiff had filed such a complaint. Nonetheless, Sanders had probable cause to arrest him, and his companions, for a violation of St. Augustine’s Open Container Law. The facts alleged and testified to by plaintiff include an admission that he, along with three friends, was drinking on the street in violation of St. Augustine’s Open Container Law. Under New York law, the admitted violation of the Open Container Law — even without Sanders’s subsequent examination of the paper bag containing cocaine — would have been enough to support plaintiff’s arrest. See People v. Bothwell, 261 A.D.2d 232, 690 N.Y.S.2d 231 (1st Dep’t), leave to appeal denied, 93 N.Y.2d 1026, 697 N.Y.S.2d 585, 719 N.E.2d 946 (1999) (noting that a police officer is authorized to arrest a person he has “reasonable cause” to believe violated the Open Container Law); see also McDermott v. City of New York, No. 00 Civ. 8311(LAK)(GWG), 2002 WL 265127 at *6 (S.D.N.Y. Feb. 25, 2002) (noting that “New York courts have recognized that where probable cause exists to arrest someone in violation of an Open Container statute, an officer may do so”) (citingPeople v. Pantusco, 107 A.D.2d 854, 484 N.Y.S.2d 321 (3d Dep’t 1985)). Thus, even under plaintiff’s version of events, there was no violation of his constitutional rights when Sanders arrested him. There is no need to reach the issue of qualified immunity; Tonawanda’s claim of retaliation simply must be dismissed. Saucier, supra, 533 U.S. at 201, 121 S.Ct. 2151 (noting that, if no constitutional right was violated, assuming plaintiff’s version of the facts to be true, there is no need to consider whether a reasonable officer in the defendant’s position would have done what defendant did). assaulted him was subjected to “severe punishment”). No reasonable official charged with hiring public employees could possibly have thought that it was constitutional to refuse to rehire an employee after his disability ended solely and simply because he was planning to sue the Village and Sanders for wrongfully breaking his arm. That being so, it is obvious that Carter and Moore cannot obtain dismissal of the claim in suit on the ground of qualified immunity. Carter protests that he is not the decision-maker with regard to plaintiff’s job, but that does not entitle him to qualified immunity. It might entitle him to summary judgment someday, but not to dismissal on the pleadings today. Moore contends that the only thing he is alleged to have done was refuse to meet with plaintiff, but he is being deliberately obtuse. Carter is alleged to have told plaintiff that he (Carter) could not rehire plaintiff because the Mayor of St. Augustine would not permit it. Moore is, in short, alleged to have made the ultimate decision not to permit plaintiff to return to work for the Village — and he is alleged to have done so solely because plaintiff had filed a Notice of Claim arising out of the excessive force incident. These allegations may or may not pan out, but Moore is certainly not entitled to qualified immunity. For if the facts are as plaintiff alleges, no reasonable decision-maker in Moore’s position could possibly have believed he was entitled to act as he allegedly did. The Village seeks dismissal of the complaint on the ground that the individual defendants should have the complaint dismissed as against them. Because none of the defendants is entitled to dismissal of the entire complaint as against him on the ground of qualified immunity, the Village’s motion lacks merit. If, at the close of discovery, there is no basis for holding the Village liable — either because plaintiff has not adduced evidence of a violation by any defendant or under Monell v. New York City Dept. of Social Services, 436 U.S. 658, 98 S.Ct. 2018, 56 L.Ed.2d 611 (1978) — the Court will entertain a motion for summary judgment. The First Amendment retaliation claim against defendant Sanders is dismissed. Otherwise, defendants’ Rule 12(c) motion is denied. A Scheduling Order is attached. Defendants have made no argument that New York’s “official immunity” doctrine should apply here. The “Twelfth Cause of Action” is captioned “Injunctive Relief.” There is no such cause of action. Plaintiff seeks a mandatory injunction as one remedy for the violations of law alleged in the first eleven causes of action. The Twelfth Cause of Action is dismissed for failure to state a claim, without prejudice to plaintiff’s ability to assert his right to the remedy of an injunction should he prevail on the claims relating to the loss of his employment. If the answer to this question is “No” — as it is in this case on one of the claims against Sanders — then the claim will be dismissed, but for failure to state a claim, not on qualified immunity grounds. Under this Court’s rules, the plaintiff is deposed before a rule 12(c) motion on qualified immunity grounds is made, so that the plaintiff’s complete story — not just the minimal allegations required of a pleader under Fed.R.Civ.P.8 — is before the Court. No other discovery (including depositions of the defendants) is permitted prior to the determination of the qualified immunity motion, however, because none would be relevant at the commencement of the lawsuit, when the Supreme Court and the Second Circuit require this issue to be decided. Plaintiff does not, in responding to the motion, raise the issue of the lawfulness of Sanders’s demand that he get out of the car. Plaintiff was eventually cited (by another officer, not Sanders) for running a stop sign. That is a violation, not a crime, and ordinarily would not permit the police to subject the plaintiff to a DeBour level two or three stop. As stated by the New York Court of Appeals in People v. Hollman, a “level two inquiry” is “activated by a founded suspicion that criminal activity is afoot,” and permits a police officer to ask somewhat intrusive questions. 79 N.Y.2d 181, 184-85, 581 N.Y.S.2d 619, 590 N.E.2d 204 (1992) (discussing People v. De Bour, 40 N.Y.2d 210, 386 N.Y.S.2d 375, 352 N.E.2d 562 (1976)). A “level three inquiry” requires reasonable suspicion that a particular person was involved in a felony, and permits an officer to forcibly stop and detain that person. Id. Thus, without a “founded” or “reasonable” suspicion that a crime had been committed, Sanders would not have been permitted to detain the plaintiff. Interestingly, Sanders does not dispute plaintiff’s description of this incident; rather, over and over again, his lawyer refers to Tonawanda’ repeated shouts of, “If I lose my job, it’s your fault,” as a “threat.” The words themselves fail to convey any threat, so it will take some information that is not yet in the record — for example, information about what plaintiff was doing at the time he shouted these words — to transform them into something that would give rise to reasonable suspicion of criminal activity — even criminal activity under Penal Law Section 240.20, let alone Penal Law Section 240.26. Sanders asserts in his moving brief that he was permitted to order plaintiff out of the car “as part of his further investigation.” (Moving Br. at 9.) Sanders does not say what he had reason to “further investigate.” I can state categorically that, on the facts testified to by plaintiff, he did not have any basis to order plaintiff out of his car on a reasonable suspicion that plaintiff either possessed or was using cocaine. Certainly, if Sanders is suggesting that his actions are shielded by the fact that Pinkus (not Sanders) had probable cause to stop the car in the first place, he is just plain wrong. Assuming arguendo that Pinkus told Sanders he had seen plaintiff run a stop sign (which would be necessary to impute Pinkus’s knowledge to Sanders under the fellow officer rule), observing a traffic violation, without more, does not give rise to probable cause to believe a drug crime is being committed.